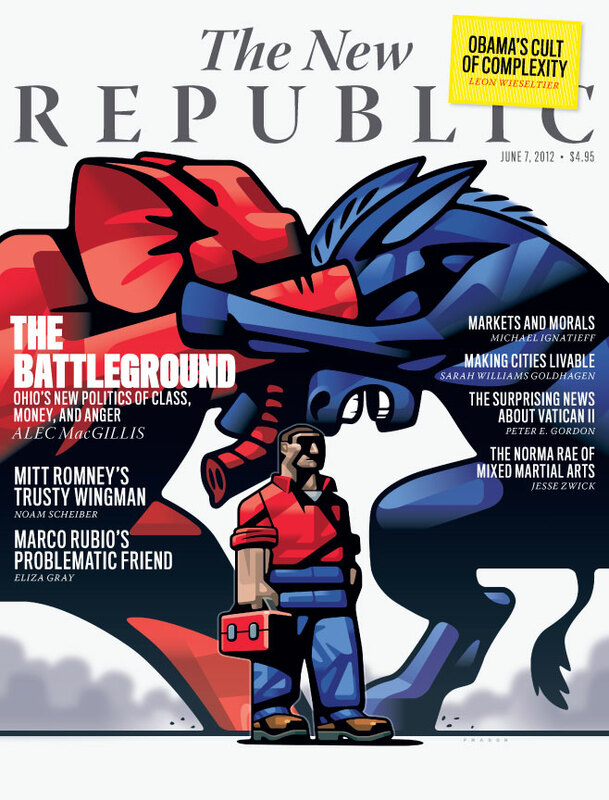 Last week Joe Heroun of The New Republic emailed, and asking if I was up for a cover assignment. Working with Joe has been a great pleasure of mine. He requested a vector execution of subject matter that I've traditionally handled with oils. That subject being the worker, or blue collar person. 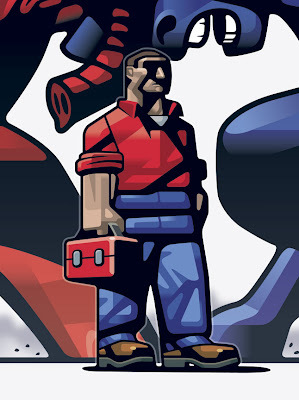 Strangely I've not done too many blue collars on workers, hmmm…. Well, anyhow, I've enjoyed Joe's direction in past as it's gotten me delving into thoughts(visual ideas) I've wanted to pursue. The cover of the issue is the pivotal battle for the state of Ohio between the Republicans & Democrats. Now elephants & mules are staples of the editorial genre, so I focused on the opportunity to push the graphic vector nature of the medium per Joe's request for my vector work. Joe & I ended up agreeing on going with a white background which contributes to the clean look of the cover. In executing the cover I went two directions for my influences, one being back to my typography classes, and the interaction between letter forms(pre-software). The other direction was forward with influence from my recent gallery work done in paint, while dealing with a subject I'd worked with in past. In the final, Joe & I created a cover I'm pleased with. As an illustrator I am still respectfully of the printed article being the work of art. It's the cover of the current issue, thanks Joe Heroun.